Youth and Philanthropy Initiative – S3 pupils are taking part in the Youth and Philanthropy Initiative (YPI) in the hope that they will learn to understand about philanthropy and charity through an experience of giving, which will highlight the positive impact they can have on their own community. Pupils will research local charities they believe are best placed to make a positive change. They will learn how to assess the charity’s management, strategy, staffing arrangements and services. By meeting a representative of the charities, pupils will develop a real understanding of some of the challenges facing the community and will, we hope, be inspired to work to change society for the better. Pupils will use their research to make presentations on the reasons that their chosen charity is most deserving of support. The team judged to have made the most compelling presentation will be given a £3000 YPI Grant to award to their charity. During this process, pupils develop skills in research, analysis, presentation, and communication, which all contribute to a pupil’s growth, and confidence. 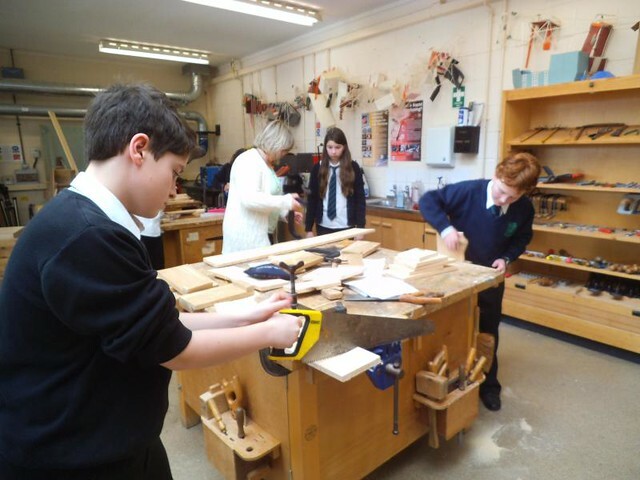 S1 build bird boxes for Inverewe – As part of the John Muir Award Conservation Section all S1 pupils made bird boxes that will be sited by the NTS Ranger at Inverewe Garden. S6 Rural Skills pupils Jake MacDonald and John Scott Macleod helped S1 with timber was supplied by Inverewe Garden. There are more photos on the website. Click on the photo to view them. Easter Egg Hunt – The Gairloch Malawi Partnership fundraising team would like to say big thank you to everyone who supported and donated to the Easter Egg Hunt last term. We organised an Easter Egg Hunt for the Primary and the High School and we would like to thank the teachers, parents and pupils for their contribution. Along with other fundraising in the High School we raised nearly £300! We have now reached the £1000 mark since we started fundraising with our new team last November. All proceeds will go towards helping four pupils and two staff from Mlozi School in Malawi to come and visit us in Gairloch in the August. See us on Facebook. S1 Beach Clean – In spite of the poor weather S1 pupils spent a morning before the holidays cleaning up storm debris from the beach along the front. We encourage all pupils to learn about the worth of being involved in their community. We want them to learn the value of working with others to make their community better. The pupils are grateful for help from the local Council workers with equipment and uplift. It’s a pity that on this occasion, in spite of invitations from the pupils, no one was able to help the youngsters. Please consider showing support in future – an effect of an hour helping our pupils may influence them in a positive manner for rest of their lives. Swimming Gala – Held at the end of last term the results are as follows: 1st – Tollaidh, 2nd – Maree and 3rd – Kerry. Well done to Iain Nelson and Alasdair MacDonald who both won all three of their finals. Thanks to all the staff who helped Mrs Johnston manage the event at Poolewe – it was a very exciting gala for those involved. Duke of Edinburgh’s Award – Innis Taylor and Siobhan Vickerstaff (both S6) and former pupil Róisín Somers have each completed their Gold Award. Well done them! MSYP – Congratulations to Jamie MacLean (S6) who has been elected as the Member of the Scottish Youth Parliament for Caithness, Sutherland and Ross. With the first meeting in June, MYSPs aim to make sure Councillors, MSPs, MPs and MEPs take account of the views of young people. Prominent campaigns currently include Votes at 16 and Poverty: See it, Change it. Solving the Rubik Cube –Bruce Wiseman (S6) took part in an international competition in Edinburgh last month. Bruce came 28th by solving a Rubik Cube in a best time of 38.24 seconds. In the ‘2 by 2 by 2’ cube competition he finished 17th. Well-done Bruce! Outdoor Certificates – Senior pupils Jake MacDonald, Neil McKenzie, Sydney Tippett, Connor Moore, James Aaron and Alasdair MacDonald have been awarded GO Mountain Bike Certificates as part of their Outdoor Education Course. James and Alasdair were also awarded NICAS level 2 awards for skills developed on the school climbing wall while Connor has NICAS Level 1. These two schemes allow the pupils to develop physical skills but also teach first-aid and self-reliance. Europe came to Gairloch High School – On the 19th of April, our Comenius partners arrived in Gairloch having travelled from Latvia, Portugal, Poland, Greece, Turkey and Finland. An exciting programme of activities was held culminating in a ceilidh in the Community Hall on Wednesday 22nd April. A few tears were shed when our guests left on Thursday morning. This event brings to an end our second two-year project and we would like to thank everyone who has supported us during that time. We hope to have photographs and news available on the website soon. Active School Coordinator Vacancy – The ASC position for Gairloch and its associated primary schools has become vacant. Please see elsewhere in the issue for the job advert. This is an important position for a graduate level applicant interested in the promotion of activity and sports participation amongst young people in the area. Details here. Application forms can be downloaded from http://www.highlifehighland.com or by telephoning (01463) 663800. – SQA national exam timetable began on 30th April. – May Day Holiday – Monday 4th May. – S2 Parents’ Evening – Thursday 7th May. – S1 Cairngorm week begins 11th May.